I have spent the past few days in Amsterdam, Netherlands, attending another edition of the International Broadcasting Convention (IBC) 2017. As usual, this was an exciting event, providing a broad picture of the current complex media technology landscape, on a global level. There is much to talk about, so many things happened there. But I will discuss what is happening in the transition to IP, because that was the historical moment. IBC 2017 celebrated the 50th year of this always-evolving conference and trade show, providing a valuable insight on current and future technologies. From IP production and distribution infrastructures to the latest sound and picture standards, this IBC provided some exciting technology previews in things such as cloud, augmented reality, audio-to-text conversion, object-based audio, voice interfaces, and much more (and those were just some of my personal focal points). IBC 2017 also confirmed a year-on-year increase in visitor numbers, marking a record attendance of 57,669 across the six-day event. There were more than 1,700 exhibitors this year, and 264 new companies exhibiting, many of which from segments as diversified as social media, over-the-top (OTT) services, VR, or 5G networks, adding to the immense variety of traditional manufacturers, from cameras and microphones, to satellite services and outside broadcast vehicles. In some of the areas, visitors could witness world-first demonstrations (Future Zone), while many start-ups had the opportunity to reach the global market at the IBC Launch Pad. Conference speakers included experts from Facebook, Google, CNN, HTC, Dolby, and most of the leading broadcast and media production organizations, discussing the industry challenges, media convergence, and technology evolution. 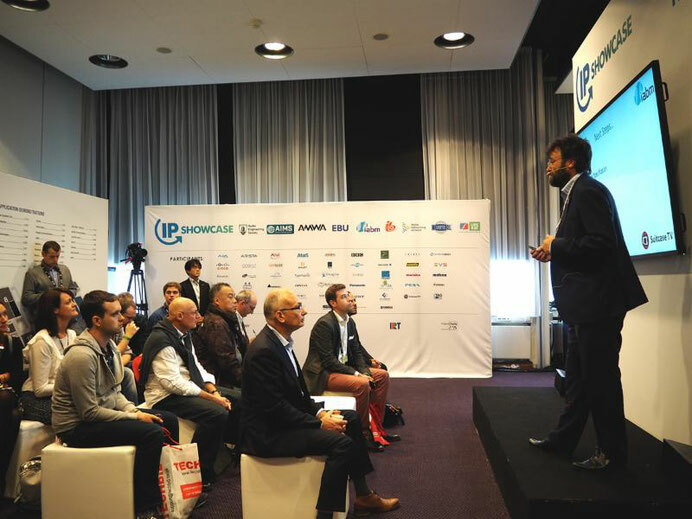 As expected, repeating the trend initiated at IBC 2016 and NAB 2017, the IP Showcase provided a real-world demonstration of a complete IP environment from production to playout, also featuring a continuous program of presentations by the world's leading experts in the field. This year, the interesting story was the fast pace at which companies from all application segments in the media industry are putting together the pieces of the IP puzzle, while quickly improving on the much-needed industry standards. Just like what happened with the audio industry, which started with a series of incompatible protocols and implementations, the rest of the media industry is now following a standards-based approach to complete the transition to IP and networked infrastructures for radio, television, and all types of content production and distribution. In the audio industry, the adoption of the AES67 audio interchange standard was the first step, and more recently the new complementary standard, AES70 - originally proposed by the OCA Alliance - is providing interesting developments to supplement AES67 audio transport with a protocol for device control, network discovery, and monitoring. The problem is that the video side of things - as demonstrated at IBC 2017 - involves a much complex equation. But at the same time, it serves to prove the validity of the undergoing audio efforts. The AES70 standard is now being implemented on AoIP and video networked systems, not only working with AES67 (the now consensual audio transport part) but also to provide integration of existing protocols, such as Dante, Ravenna, and even AVB, together with the new SMPTE standards. From previous audio-centric forums, such as the Media Networking Alliance (MNA) or the Avnu Alliance, the audio industry is now joining the work of the Alliance for IP Media Solutions (AIMS), or the Advanced Media Workflow Association (AMWA), creating open specifications for complete networked media workflows - carrying video, audio, synchronization control, and file transfer. AMWA has already developed the Networked Media Open Specifications (NMOS) to support management of software and equipment on a network, and there are a series of efforts to extend its scope to cover transition scenarios from current technologies (e.g., SDI), as well as future fully IP-based systems. For a complete overview of that effort, check the website www.nmos.tv. The complexity of the ongoing work is simply too vast to address in this space, but the important thing is how virtually everyone is onboard and how more and more companies are joining the effort. 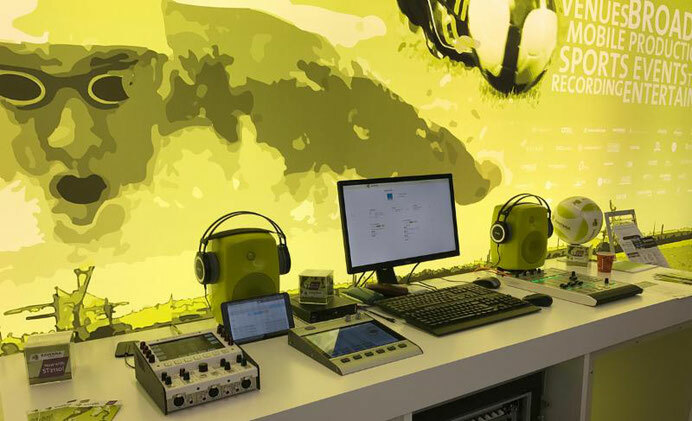 The challenge for the audio industry, at this stage, is how to monitor and manage devices in this complete audio, video, and data infrastructure, ensuring that current existing systems and solutions that have now been widely adopted within audio-only production environments can still work. For that, interoperability demonstrations such as the IP Showcase are vital to understand what needs to be done. For instance, the same companies and experts that are working on AES70 applications, need to closely follow the work of the AMWA on the new connection-management specification, IS-05, which will be complementary to the existing IS-04 registration and discovery specification. I honestly tried to understand what the implications were, but I was told, "too soon to say." That same effort was visible in demonstrations taking place in the booth of several companies. Canadian company Ross Video, that now owns Coveloz, did a joint demonstration of AMWA's latest specification for open connection management in IP control systems, in collaboration with another leading Canadian company, Evertz. Systems from both brands were used to demonstrate the AMWA IS-04 and IS-05 specifications for NMOS discovery, registration, and connection management APIs. Both companies have also supported the demonstrations of the recently published SMPTE ST2110 standard, that most audio companies are now implementing. All the meetings I could get with experts from all those companies confirmed that, around the globe, large scale IP-deployments are already happening and that the industry is moving fast. Those deployments need to be "vendor neutral," in terms of network control, but in practice the engineering effort is still ongoing. And that's clearly visible in the audio industry, where I learned that all companies are joining the AMWA, AIMS, and ST2110 workgroups to complete the process. Measuring signals over the IP infrastructure according to the new standards brings a whole new set of challenges. Companies such as Phabrix are already working hard on that mission. The RAVENNA booth, in particular, had demonstrations with equipment from Sonifex, Merging, Lawo, DHD, Digigram, DirectOut, Lawo, and Riedel, while sound was played using the new Genelec 8430A IP SAM monitors. All already ST2110-compliant. As the RAVENNA experts explain, "the clocking principle and transport protocols defined in ST2110-10 and ST2110-30 are fully in line with RAVENNA technology. The RAVENNA system timing was designed on the principles of IEEE1588-2008 (PTPv2), as is SMPTE ST2059-2 which is the fundamental timing standard for ST2110; consequently, RAVENNA fully supports the requirements of ST2059-2." The IBC IP Showcase provided integration with both Dante and RAVENNA AoIP solutions, all part of a ST2110-based workflow. But there were still many systems connected with the current ST2022 set of standards for Real-Time Video/Audio Transport Over IP Networks, which is what allows SDI-based systems to interoperate - if we want to extract audio from most current IP networked systems based on ST2022, we need to extract everything back to SDI, and only then de-embed the audio channels. ST2110-based installations put each part of the signal into a different stream and make video, audio, and ancillary data (e.g., subtitles) all separately routable. Instead of feeding the whole bandwidth, an audio system is able to request only the intended audio channels. And we need to consider that "audio" in the new production, broadcast, and media distribution formats means new things like immersive audio channels (e.g., Dolby AC-4), or object-based audio (e.g., MPEG-H), both already part of the new ATSC 3.0 and UHD DVB television standards. The SMPTE published the approved ST2110 standards document precisely while IBC was ongoing (September 18, 2017). The new standards suite specifies "the carriage, synchronization, and description of separate elementary essence streams over professional internet protocol (IP) networks in real-time for the purposes of live production, playout, and other professional media applications," and is described as essential to support "an entirely new set of applications that leverage information technology (IT) protocols and infrastructure." 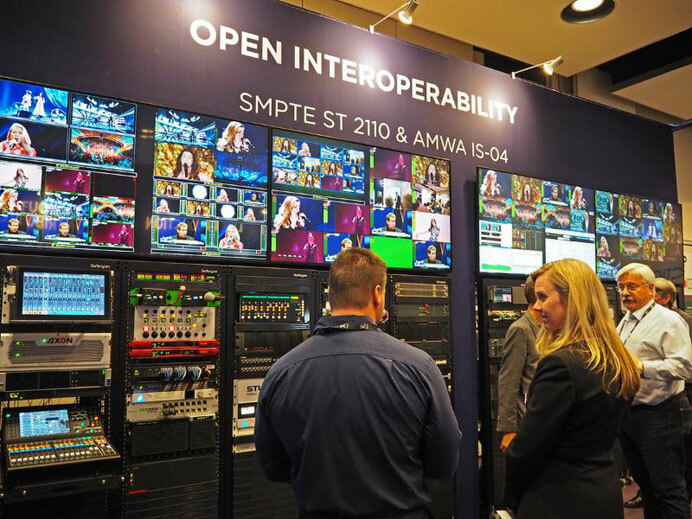 Understandably, the new SMPTE ST2110 standards were a primary focus of the IP Showcase at IBC 2017, where SMPTE joined with the Audio Engineering Society (AES), Alliance for IP Media Solutions (AIMS), Advanced Media Workflow Association (AMWA), European Broadcasting Union (EBU), IABM, Media Networking Alliance (MNA), and Video Services Forum (VSF) to support the event. 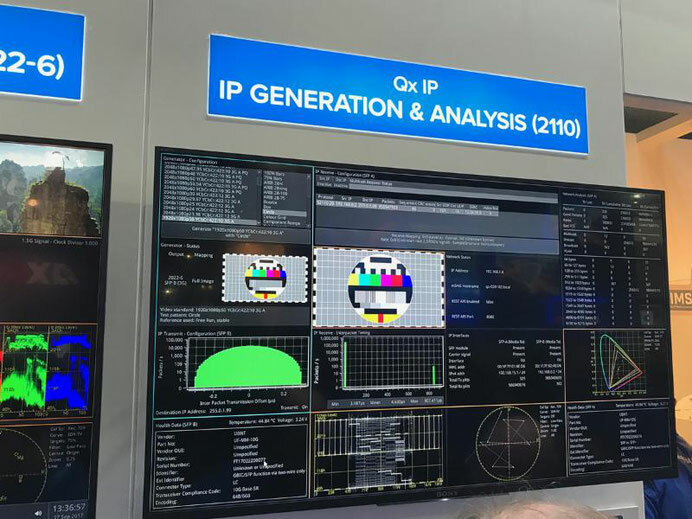 As part of the IP Showcase, audio companies were demonstrating a connection management based on the latest AMWA NMOS IS-04 and IS-05 specifications, toward the integration of AES67 and ST2110 products. Make no mistake. What happened this year at NAB 2017 and now at IBC 2017, and all that is happening at these industry forums, is history in the making. Anytime we connect our IP-speaker directly to a network cable coming from a system rack and we hear audio playing, we will have to thank all the amazing engineers and company executives who have dedicated the talent, hours, and resources to make it a reality. And the IP future promises to be truly exciting! We are fast approaching the 143rd International Audio Engineering Society (AES) Convention, taking place October 18 to 21, 2017, at the Jacob Javits Center in New York City. The event will be co-located with the NAB Show New York 2017. The IP revolution will continue there, providing a unique chance for all audio experts to get engaged.